This product has been around for many years. My mother used to use it to style and care for my hair when I was a child. So it is one of those “throwback” type products. The name of the product is Dax Pomade and it is enriched with lanolin and compounded with vegetable oil. I purchased it at a local beauty supply store for about $3-$4, in a 7.5 oz. plastic jar. It is a very thick, green oil, that is solid at room temperature. The scent of Dax Pomade is pleasant and very mild. The manufacturer says that the product is “ideal for dry, brittle hair that breaks short at the ends. Daily application will improve the overall condition and appearance of the hair.” I find this statement to be mostly true. I don’t use this product as much as I used to because it is so greasy. I am African-American, with thick, coarse (nappy) hair. When I wore my hair relaxed, I used Dax Pomade a few times per week to keep my hair moisturized and to protect my hair from breakage. Due to the fact that the product contains substances like petrolatum and mineral oil, which are irritating to my skin, I had to drastically cut back on its usage. Whenever I used it regularly, I would get big acne carbuncles on my face. What many people may not realize is that sometimes products that we use on the hair and scalp may also affect the condition of our facial skin. When you sweat, certain hair care products can run down on your face and clog your pores. This can result in a very nasty case of acne for some people. Now that my hair is natural and unprocessed with harsh chemicals, I don’t rely as heavily on products such as Dax Pomade to keep my hair moisturized. I rely more on non-greasy, leave in conditioners or lighter oils to keep my hair moisturized. 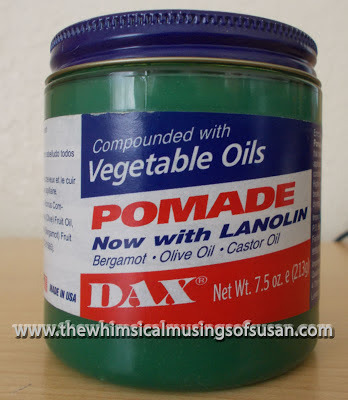 When I do use Dax Pomade, I do so very sparingly. I wash and condition my hair. Then, I apply it by rubbing a small amount on my fingertips and massaging it into my scalp. I take a very small amount into the palm of my hands and rub some into my hair. I do this once per week or less often. I have had that same jar of product for over two years, because I use so very little. To protect my face and bedding from the oils, I wrap my hair up well before bed. Dax Pomade does make my hair feel more softer, and easier to comb and style. I won’t feed you a bunch of BS about how the product will make your hair grow long. I think that it is in the league of other similar products like Royal Crown grease and Blue Magic hair grease. Dax Pomade is not a “natural” product per se, but I really like that it is not loaded up with a long list of synthetic, hard to pronounce chemicals. It is a very nice, cheap and effective product. Also, people of various races and ethnic backgrounds use this product. The only negative with Dax Pomade is that it is very greasy and can be irritating to the skin. Petrolatum, Mineral Oil (Paraffinum Liquidum), Lanolin, Ricinus Comunis (Castor Oil) Seed Oil, Cocos Nucifera (Coconut) Oil, Olea Europaea (olive) fruit oil, Fragrance (Parfum), Citrus Aurantium Bergamia (Bergamont), Fruit Extract, D&C Yellow 11 (CI 47000), Green 6 (CI 61565). Dax Pomade is manufactured by Imperial Dax Company, Inc.